IGI software products view and edit a wide variety of data formats, including GDSII data. For a free GDSII viewer, download our IGI PT Viewer to see how it works. Input is easy for all IGI software products. Just drag and drop GDSII files on the IGI software icon to import them. Import multiple files at one time. You can import and view files with other formats together with GDSII data. Typically GDSII data reads in without any adjustment. 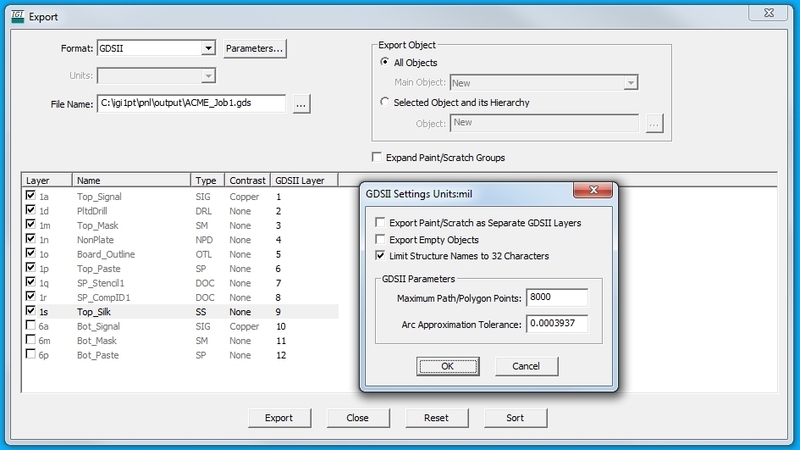 For cases where unique parameters were used in the data, IGI software offers settings to control input units, skip empty GDSII structures, handle text, and import GDSII boundaries and paths onto separate layers. Once import is complete, take advantage of the powerful array of viewing and editing tools available, that goes beyond zooming and scrolling, to find zero width geometry, smallest geometry, calculate areas and much more. Most viewing/editing features are included with the free GDSII viewer, (IGI PT Viewer) but saving and exporting data are disabled until a license is purchased. Whether your GDSII data is flat or hierarchical, IGI software provides tools to configure GDSII output options. Paint/scratch layers merged or expanded for export. Hierarchical only: select which object to export and whether to export empty objects. GDSII data export is a licensed option for IGI software. The free GDSII viewer, (IGI PT Viewer), can be upgraded with a product license which includes saving and exporting data.